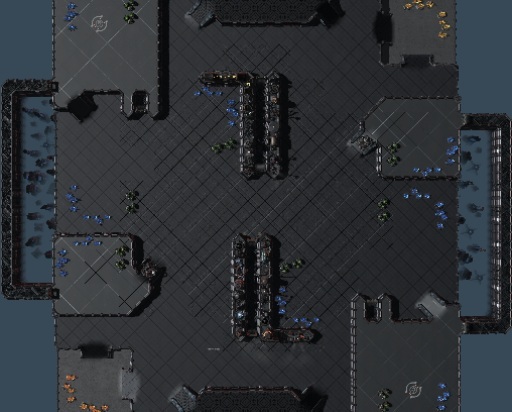 recently created a cool new melee 1v1 map with a concept that I've never seen before. I was thinking about one of blizzard's recent new melee maps that had a thin bridge between the two main bases that made rush distances really short. I was also thinking about how zerg use air vents in the sc1 campaign and the sc2 campaign and I kind of wanted to combine these ideas to create a really interesting melee map and this is what I ended up with. Basically, the air vents can be accessed by air, but until then, only small infantry can enter through the air vent entrances. It's possible to drop larger units, but again that takes air. You also can't build inside air vents. I will attach a screenshot and the file so you can see it. I also uploaded it on NA server as "vented network". Edit: Requires HOTS to play, but the concept can be used in WOL as well.